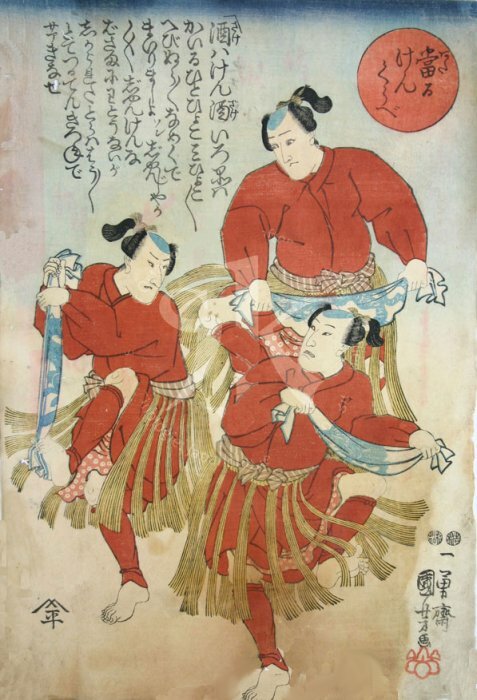 Prints depicting the game of ken (拳) are called ken no e (拳の絵). 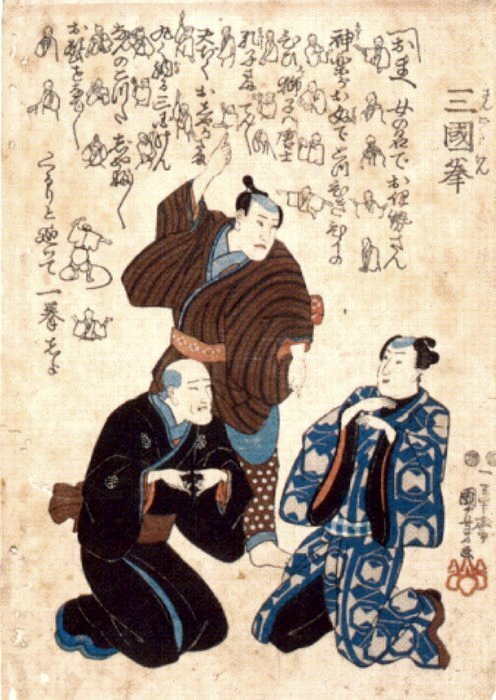 Ken was often played as a drinking game and was incorporated into several kabuki plays as a dance. 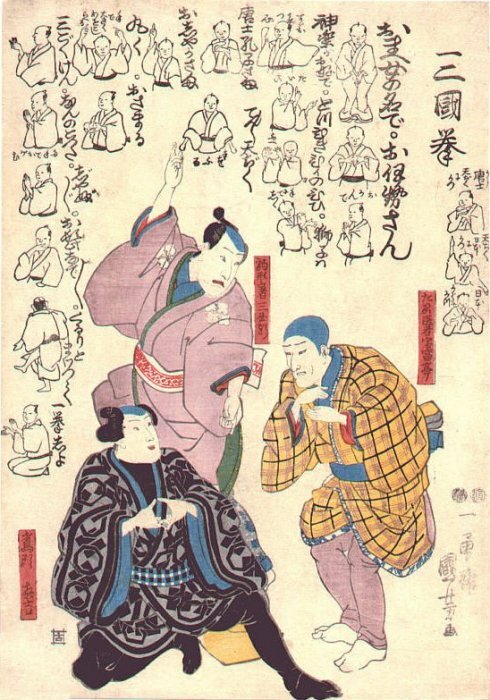 The prints with small human figures illustrate the dance steps. 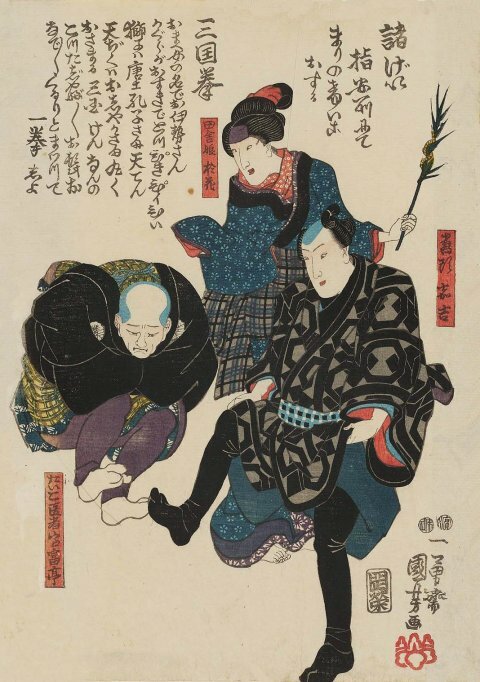 After the imposition of a ban on actor prints in 1842, Kuniyoshi produced numerous humorous designs with thinly disguised actors’ portraits as animals or other objects playing ken. 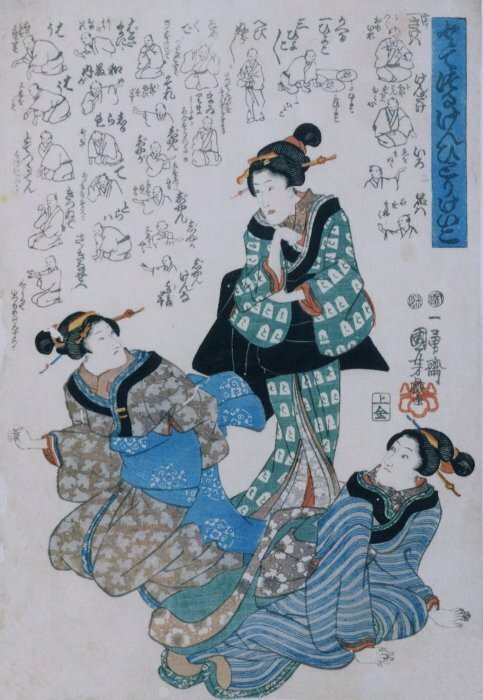 All the prints reproduces in this section are either single ôban (about 14 by 10 inches or 36 by 25 centimeters) or composed of more than one ôban sheet placed side-by-side. 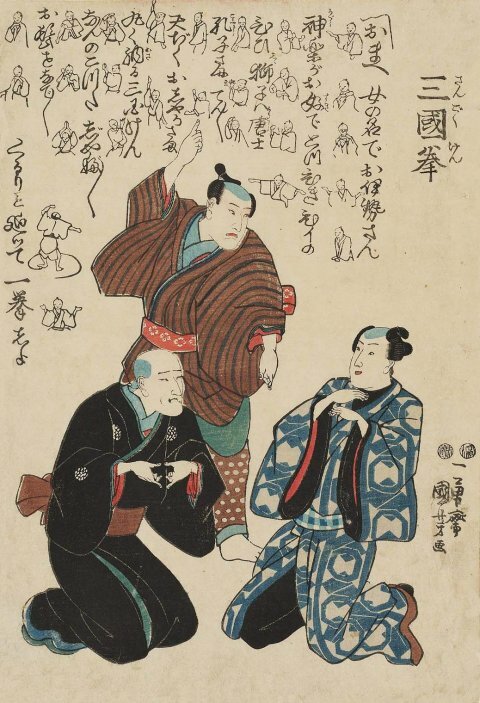 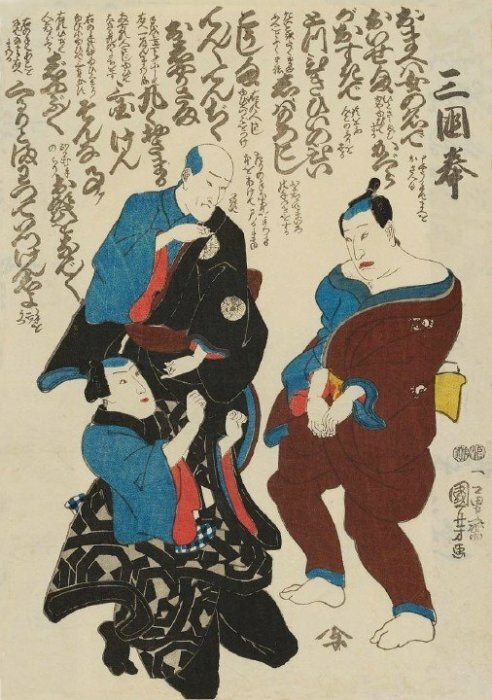 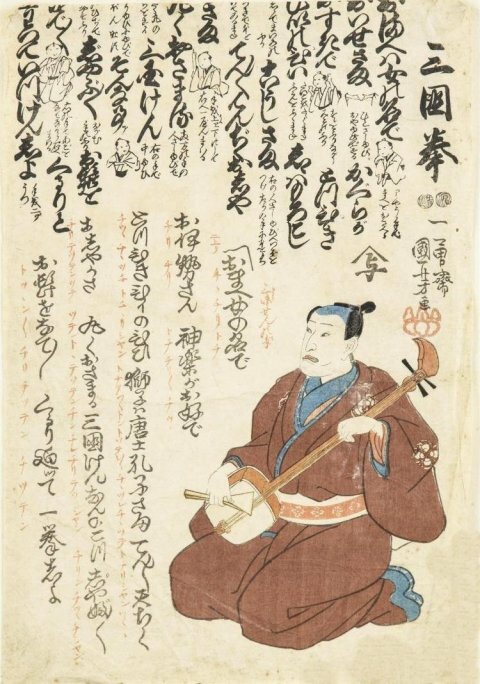 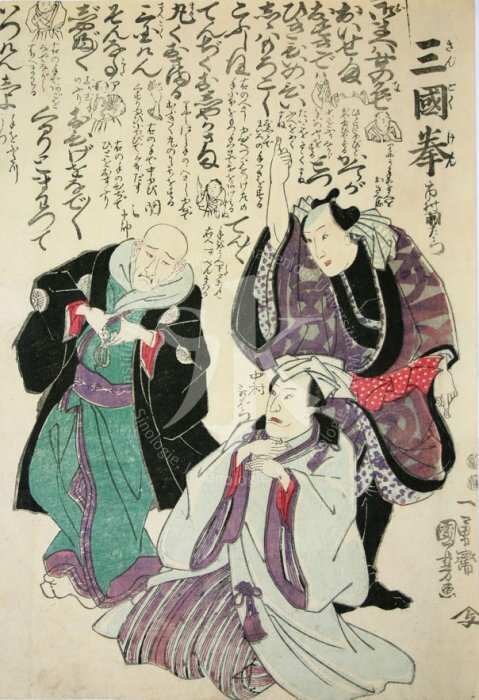 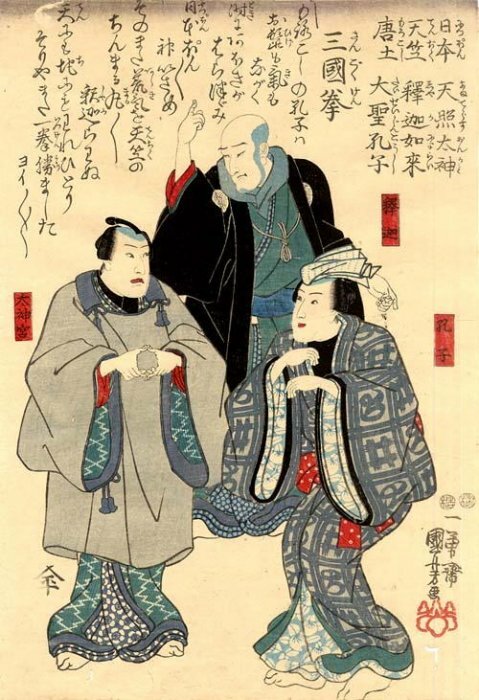 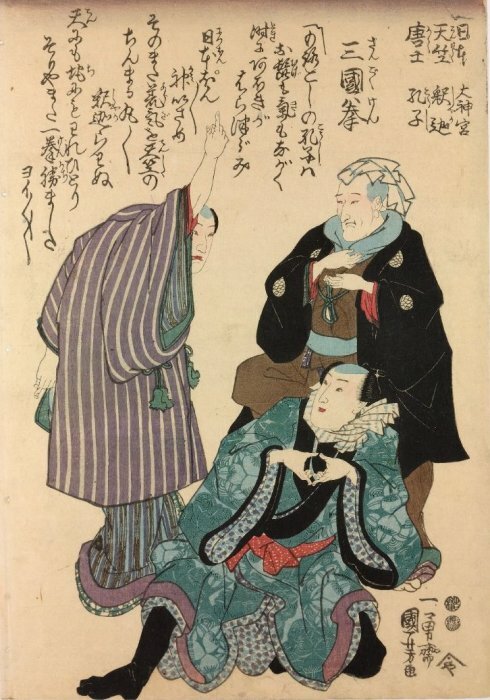 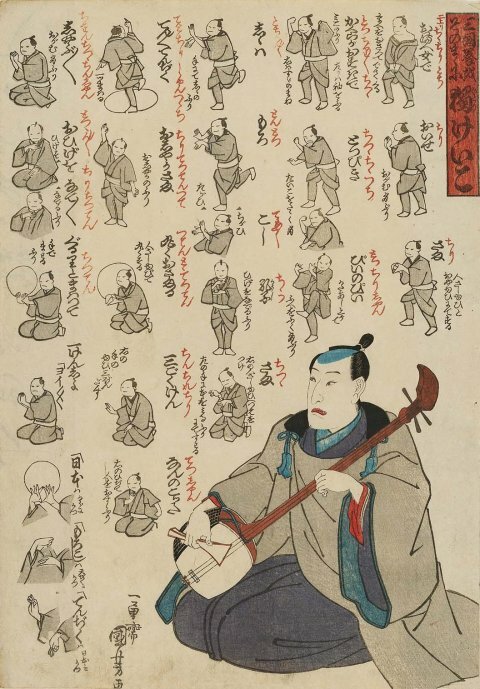 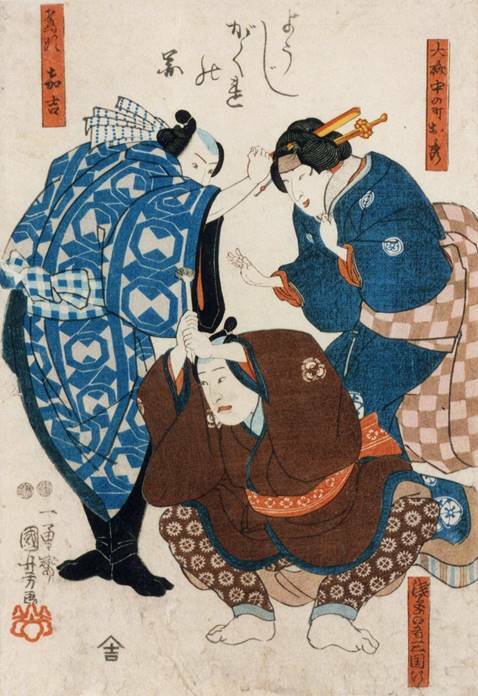 Additional information about these prints may be found in the article: Linhart, Sepp, Kuniyoshi’s Ken Caricatures between 1847 and 1853, Andon, Vol. 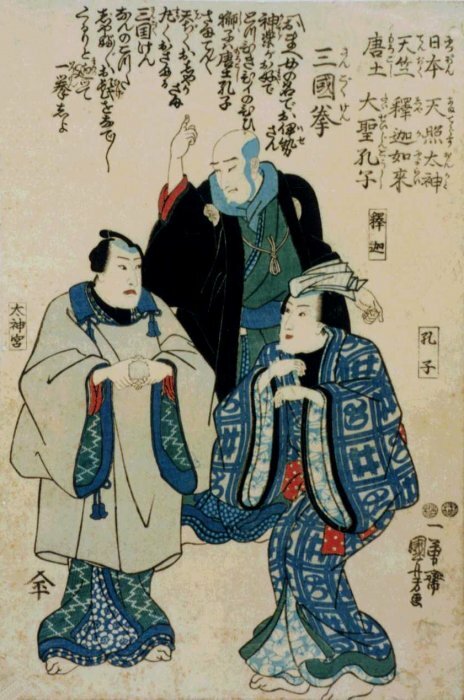 83, 2008, pp. 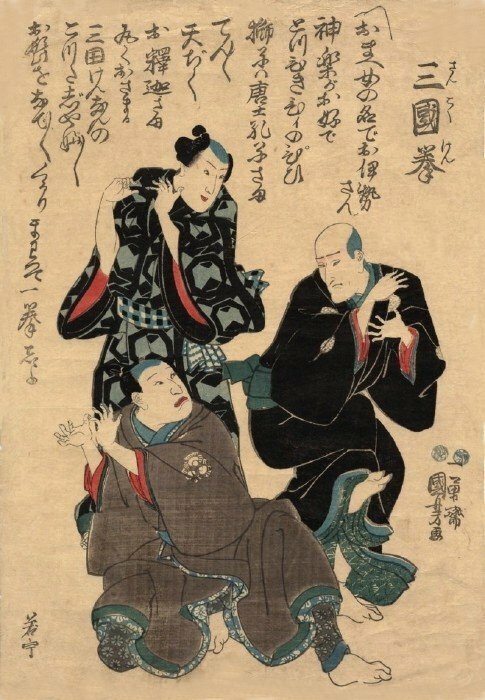 5-29. 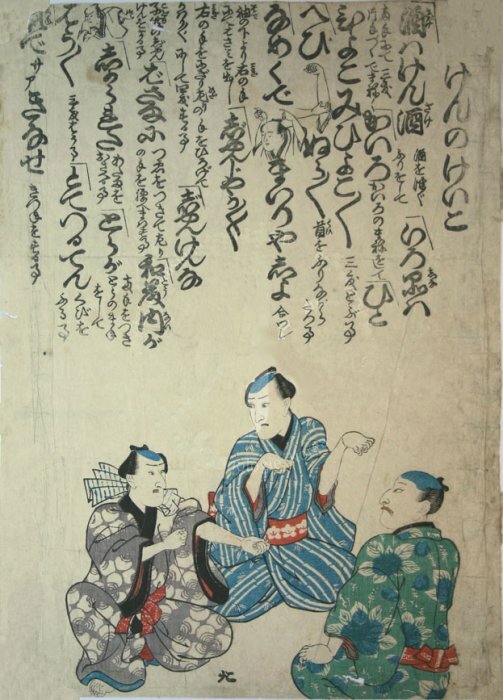 Matsumoto Kôshirô VI (left) playing the game of ken. 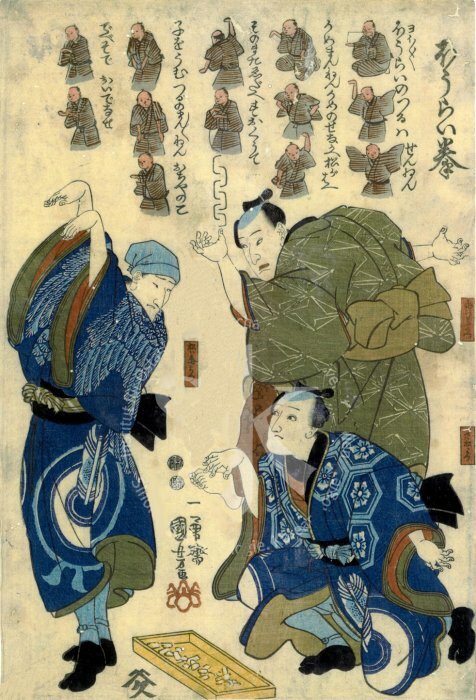 NOTE: This print is from the series “Daruma’s Buffoonery” (Dôke Daruma asobi) which is listed as number 191 in Kuniyoshi by Basil William Robinson (Victoria and Albert Museum, London, 1961). 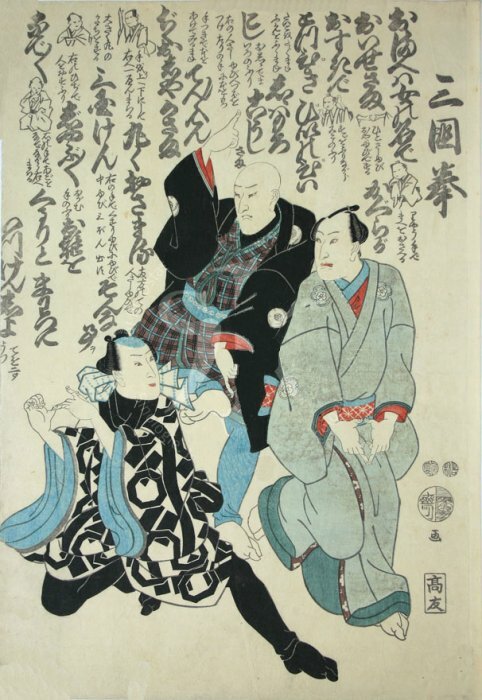 The background is printed in yellow, as in other prints from this series. 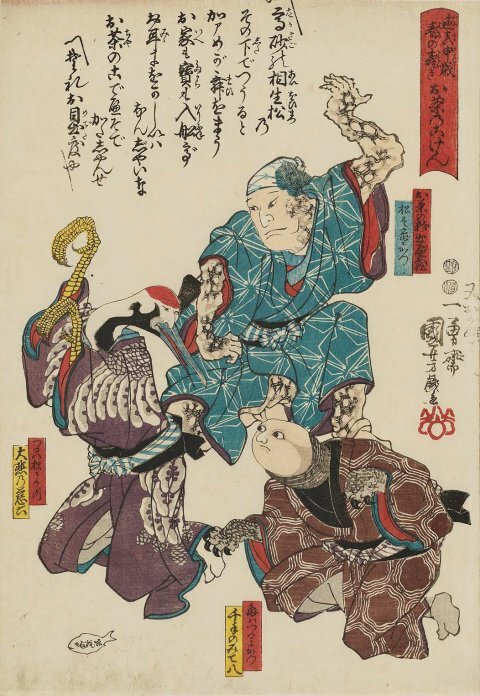 I am grateful to Marc DeVriese for this variant with bokashi (gradual shading of color) on only one figure. 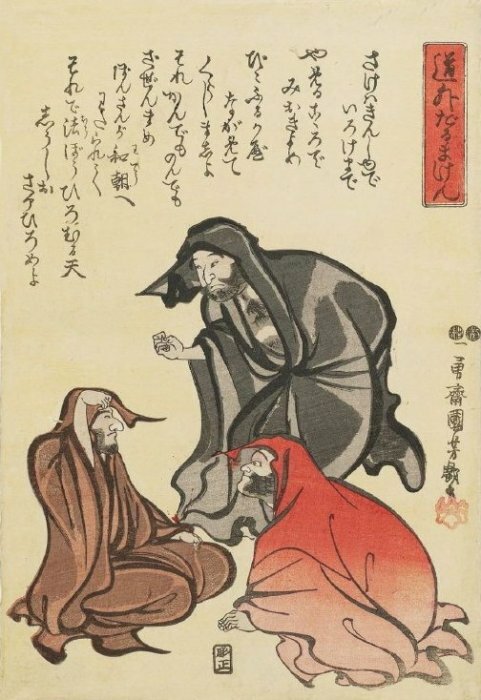 I am grateful to Marc DeVriese for this image.